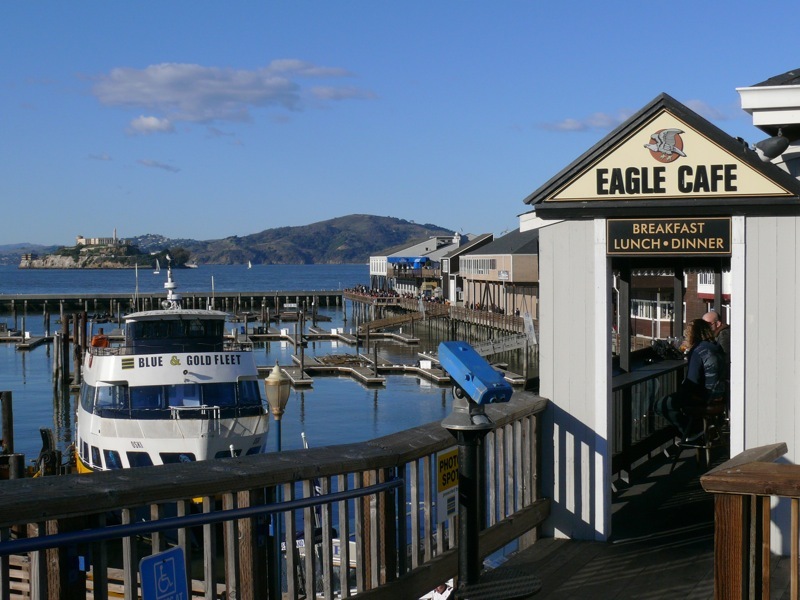 Located along the San Francisco Bay, billed as “San Francisco’s premier bay attraction,” the Eagle Cafe has a longer history than it's location at the Pier 39 arcade might suggest. In the 1920s, the building was a hash house on the northern waterfront, serving a mixed crowd of longshoremen, fishermen, bus drivers, and artists. 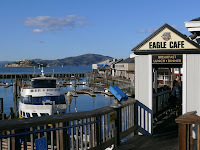 In 1978, the building was moved to Pier 39, where the Eagle Cafe sits today. Fresh seafood highlights The Eagle’s offerings—and superior service from the friendliest folks you’ll ever know—completes the experience you’ll receive. There was about a 10 minute wait when we arrived, but we were in no hurry as our boat tour was not until noon. It was a bit overcast this morning, so it was nice to sit inside but I imagine sitting along their outdoor bar area would be very cool, especially with a prime view of Alcatraz across the bay. Many of the breakfast items looked good and hearty, but I settled on the Banana & Pecan French Toast. It came with a large watermelon slice on the plate that was juicy and refreshing. The French toast itslef was cut thick and not overly sweet. The fresh bananas on top also helped keep this dish light. Keith ordered the Corned Beef Scramble, which was their famous corned beef hash mixed with eggs and tomatoes, covered with cheese and served with a large bun in case you wanted to make your own sandwich. This corned beef was in big chunks, different than other kinds that Keith has had before, but it tasted good. Oddly on the plate was a handful of fried spaghetti pasta. Keith asked if he was supposed to eat that, but I advised it must just be for decoration. I later confirmed that with the server, inquiring if there was some back story to the fried garnish and he stated "No, it's just for decoration." No big scoop there. All in all, Eagle Cafe was charming and seemed to be popular with both locals and tourists alike due to it prime location. The servings are quite generous and the ambience is warm and inviting.